Sara had a hard start in life. She spent the time from age 8 weeks to about 10 months in a kennel with almost no human contact and very little stimulation. When it turned out she could not have puppies, her owner no longer wanted her. Not surprisingly, she has some problems. Sara is extremely shy. She used to be afraid of everything, people, cats, dogs, firehydrants, the wind, mailboxes, poles, tree branches, motorcycles, bikes, rollerbladers, children, and, quite literally, her own shadow. In addition, she is very submissive, and she would submissively urinate if anyone so much as looked in her direction. Sara has come a long way since she came to live with us. She almost never submissively urinates, and she is learning that the world is not such a terrible place. She is still afraid of strange people; she will not allow strangers to approach her. She is terrified of children. But she no longer is afraid mailboxes, cats, other dogs, and most stationary objects. A pole, however, must be treated with caution. I have hope that, someday, Sara will be able to approach new stimuli and new situations with caution instead of fear. The people on the shy-k9s mailing list have been an invaluable resource. I cannot thank them enough for the support and advice that they have given. To subscribe to shy-k9s, send mail to shy-k9s-subscribe@yahoogroups.com or visit shy-k9s at Yahoo!Groups Shaman was another dog on shy-k9s. His page is sad, so have a tissue handy. 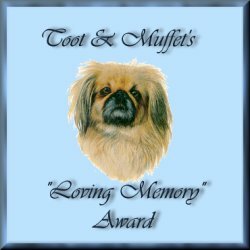 The shy dogs links page has more shy dogs homepages and links to other useful information for helping your baby. Check out the shy-k9s FAQ and this article on building confidence in a shy dog. I wrote the 12 step program for shy dogs tongue-in-cheek, but there is a lot of truth in the program. Sara 2 and 1/2 years later. We lost Sara to cancer in June of 1998. She was our big, sweet girl. 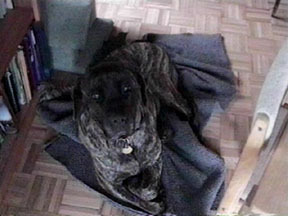 In memory of Sara, I ask that you do everything you can to prevent the breeding of fearful dogs. I dreamed of a day when Sara would be a cautious, instead of fearful, dog. We never did realize that dream. Sara's life was hard because she was so afraid. 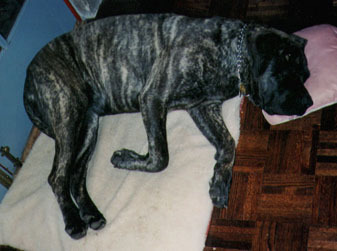 That island of England breeds very valiant creatures; their mastiffs are of unmatchable courage. It is cruel and unfair to breed dogs that are fearful. 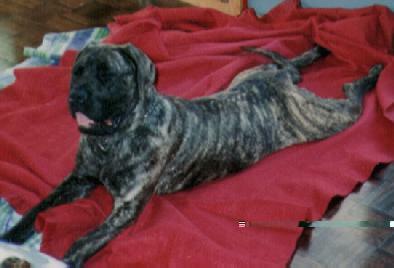 Sara was a beautiful mastiff. Her lines were great. Her coloring was wonderful. Her head was perfect. None of that was worth her being afraid of her own shadow, and she certainly wasn't showable with a fearful temperment. A cowering, submissively urinating dog makes a very poor impression on a judge. Much as I loved Sara, she never should have been bred. Sara woofed, a lot :-), on rec.pets.dogs.misc. I would like to say thank you to them for the outpouring of sympathy and support that they gave me when I told them that we had to let Sara go. site is owned by Neefer in memory of Sara. Do you want to join the ring? 5809 hits since my counter broke. 7282 hits since December 27, 1997 at the old Aimnet site.